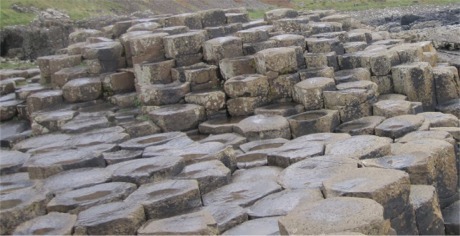 VISITS to the Giant's Causeway jumped by almost 50,000 last year thanks in part to epic fantasy drama Game of Thrones. Latest figures show that the iconic Northern Ireland landmark - which is regularly accessed by tourists using the Lough Foyle Ferry in Greencastle - attracted more than half-a-million visitors (549,066) in 2014-2015. The ancient site famous for its hexagonal basalt columns, is by far the most popular site in the Trust's 500-strong heritage portfolio. The causeway, which is near many of the filming locations for Game of Thrones, attracted some 144,000 extra tourists than the next most popular site - Stourhead estate in Wiltshire. And its sister site Carrick-a-Rede rope bridge, less than 15 minutes away, also felt the pulling power of the HBO drama, according to the annual report from Britain's National Trust. Greencastle can also boast another positive link as talented young actor Art Parkinson from neighbouring Moville also stars in Game of Thrones.